The remote control unit is suitable for installation in cockpits in line with MS 25212. Like the R&S®M3AR transceivers, the R&S®GB6500 remote control unit was qualified in line with military environmental and EMC standards such as MIL-STD-461 and is therefore suitable for use in aircraft. The R&S®GB6500 can operate all series of the R&S®M3AR family and connects to the radio via the RS-485 interface. A maximum of three R&S®GB6500 units can control up to five R&S®M3AR transceivers via the RS-485 bus. The radios can also be controlled via the MIL-STD-1553B data bus. The R&S®GB6500 display is suitable for conventional night flights as well as flying with night vision goggles (NVG). The haptics of the controls were optimized for aircraft conditions so that the device switches are easy to press and regulate when wearing gloves. This also makes them easy to operate under harsh flying conditions. Presets are selected via the keypad. The submenus contain additional settings that can be performed via the control pad. Settings can be made quickly using the userfriendly menu structure without focusing too much of the pilot's attention on the radio controls. The R&S®GB6500 user interface is identical to that of the R&S®MR6000L, which simplifies crew training. The R&S®GB6500 can operate all series of the R&S®M3AR family and connects to the radio via the RS-485 interface. A maximum of three R&S®GB6500 units can control up to five R&S®M3AR transceivers via the RS-485 bus. 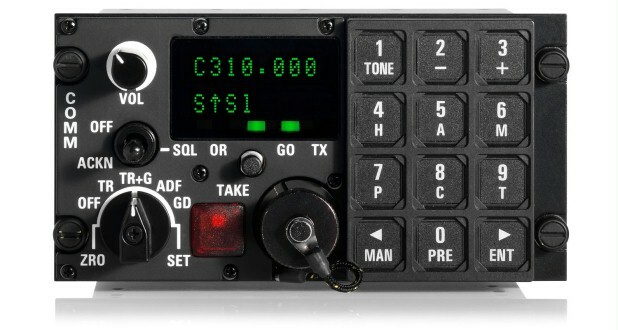 The radios can also be controlled via the MIL-STD-1553B data bus. The R&S®GB6500 can serve as a backup in this case.